The Mets made their next round of minor league demotions this morning; most notably including Wilmer Flores. I know this doesn’t come as a complete shock, but I was holding on to hope that Flores would make the trip north. Shortstop has been at the center of many conversations/rumors this off-season for the Mets. We’ve heard it all from the front office being disappointed in Ruben Tejada, talking (but not talking) to free agent Stephen Drew and discussing the possibility of a trade for Seattle’s Nick Franklin or Arizona’s Didi Gregorius. Despite all of those grumblings, Wilmer Flores has emerged into a legitimate internal candidate to fill this apparent hole. 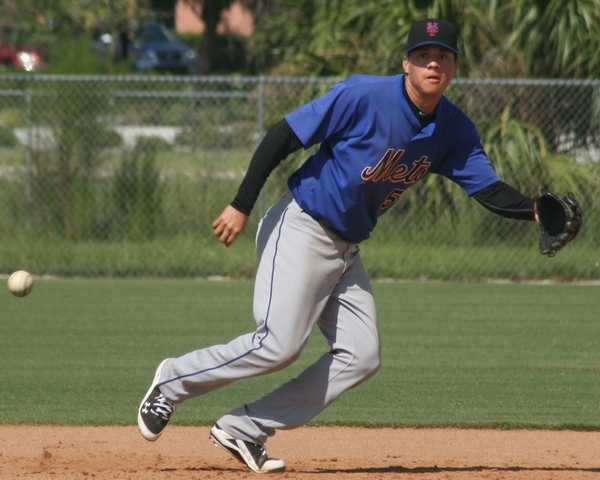 Flores left quite an impression this spring with his transition back to his natural position. After spending much of the winter at a Mets training facility, he arrived at camp in the best shape of his life. Normally that sounds like a cliché, but there was a noticeable difference in his body this spring. Although he came up a shortstop, he quickly was thought to have outgrown the position with his bulkier build and had been moved around the infield the past few seasons. But with the continued struggles of Ruben Tejada, and Flores new-found agility, this experiment seems to be gaining some legs. There hasn’t been much doubt about Flores offensive production, as he has done nothing but produce with each promotion he has made at the minor league level. This spring shown some pop with a .238 average/2 homeruns/9 RBI in a small sample size. However, the most impressive thing he has displayed this spring wasn’t with the bat, but proving that he can be a capable defensive shortstop. I don’t think anyone would ever expect him to be a gold glove caliber defender, which just isn’t fair. The best comparison I can think of is Johnny Peralta, a shortstop with a larger build who is known much more for his offensive production. He may not have the range, but he makes all of the plays he is supposed to make. That would be the ideal player I would hope Flores can develop into. If Ruben Tejada was a defensive wizard, I wouldn’t have any problem with him. You could argue that the biggest surprise has been the major step backwards his defense has taken. There have been routine ground balls this spring that have eaten him up. That just isn’t acceptable. When Tejada first arrived he surprised us all with his production at the plate. He working the count and finding ways to reach base, but that has quickly disappeared. His bat is sluggish through the zone as pitchers continue to simply overpower him. If Tejada is unable to provide any sort of plus attribute, then I don’t want to see him playing every day. As much as I would love to see Flores as the opening day shortstop, I understand the need for him to gain more experience at the position before making the jump. I would expect Wally Backman to be running Flores out at shortstop every day in AAA, giving him the reps he needs to prove he deserves a promotion. Backman, being a former middle infielder himself, should be able to help his continued defensive growth. I just hope the Mets don’t toy around with his progress and shift him around every other game, either play him at short stop or don’t. That’s the only way we will find out if he will become a capable of playing the position at the major league level. Tejada will be on a VERY short leash to start this season. If he wasn’t feeling the heat from the front office already, he will quickly feel it from the fans if he gets off to a sluggish start. I don’t think a trade is in the works just yet, as teams are pushing for young pitchers that Sandy Alderson isn’t ready to part with. With that in mind, Flores should have a bag packed at all times, ready to answer that call and return to Citi Field.